Where do I find my Vehicle Identification Number? The Vehicle Identification Number is located on a silver sticker at the front of the trailer on the inside of the rail on the passenger side. A decal is also placed on the bottom of the tongue of the trailer. For EZ Loader Custom Trailers only, if the silver sticker is faded you can find the last 5 digits of the VIN number stamped on top of the trailer frame, before the frame welds into the trailer tongue. EZ Loader can recover the complete VIN number with these 5 digits. 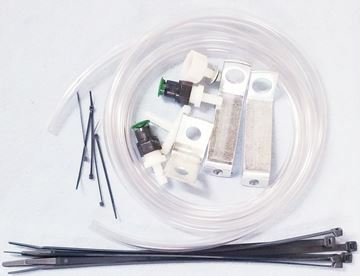 What type of Hydraulic oil do I use for my brake actuator? Dot 3 type brake fluid. How do I identify which division of EZ Loader my trailer was built at? If the Vehicle Identification Number starts with first three digits of 1L8 it is manufactured by our Custom Trailer Division in Midway Arkansas. If the first three digits start 1ZE, it is an EZ Loader Adjustable trailer manufactured in Spokane, Washington. While both EZ Loader Custom trailers and EZ Loader Adjustable trailers look similar in many aspects it is important to know that each Division of EZ Loader uses different parts and that they are not always interchangeable. See telephone numbers at the top of the screen to contact the correct Division of EZ Loader for your trailer. I am having a problem backing up. My brakes are locking up, especially backing up a hill, what is the reason? 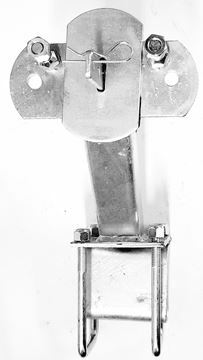 Disc brake actuators have a built in solenoid switch, and it must be connected to a 5 way trailer harness. If the trailer harness is not connected to the tow vehicle the trailer will not back up without a backup key found in the owners warranty package. If the trailer brakes are locking up while attempting to back up check the Trailer Back-Up fuse in the tow vehicle. This fuse is generally located in a smaller separate fuse box. Check your vehicle owner's manual for the location of this fuse. If problems still arise contact your local dealer for assistance. My tires seem to be wearing excessively. Why? The correct tire pressure is very important to maintain. Every tire is stamped with the PSI needed to maintain the carrying capacity of the tire. Running the tires with less than the recommended PSI will cause wear on the tires and decreases the carrying capacity of each tire and could cause the tires to fail. In the event the tire has hit a curb or pot hole hard enough the alignment of the axle being bent can also cause excessive tire wear, specifically on the outside or inside edge of the tire. See your local dealer for assistance if that is the case. My trailer lights are not working but my truck lights are, what is wrong? All the lights installed on your trailer leave the manufacturing facility working correctly and are 100% inspected on every trailer. In the event a light or lights are not working, it could be a result of a blown fuse in the tow vehicle or there could be an issue with the wiring harness on your trailer. Check the plug on your trailer harness for a proper connection. Make sure that the leads on the harness are clean and are making proper contact. If your trailer has a swing tongue, make sure that the wiring harness inside the tongue has not been pinched. A bare exposed wire on the trailer frame can cause some of the lights to not work. Contact your local dealership for further assistance if needed. How long is my trailer warranty? Custom Trailers: The warranty for new EZ Loader Custom trailers is 5 years from date of purchase or 6 years from the manufacturing date of the trailer, which ever comes first . Your trailer must be registered to receive this limited warranty. Full details of this warranty can be found in your EZ Loader Owner’s Manual. If you did not get an owner’s manual from your dealer, you should request it. You can also download it or call EZ Loader Custom at 800-553-7855 to request a hard copy. 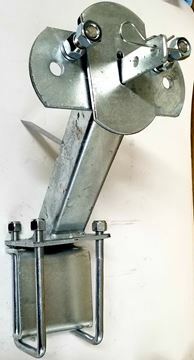 Adjustable Trailers: EZ Loader Boat Trailers, Inc. warrants each new Adjustable Boat Trailer to be free from defects in materials and workmanship for a period of three (3) yearsfrom the date of manufacture, or two (2) years from the date of first retail sale, whichever occurs first". EZ Loader shall repair or replace, without charge,any parts found to be defective because of imperfect workmanship or materials, within a reasonable time after the trailer is returned at purchaser's expenseto any EZ Loader authorized distributor or dealer. Your trailer must be registered to receive this warranty. Full details of this warranty can be found in your EZ Loader Owner’s Manual. If you did not get an owner’s manual from your dealer, you should request it. You can also download it or call EZ Loader Adjustable at 800-398-5623 to request a hard copy. My Tuff Coat does not have the luster and shine it first came with. What can I do? You can use automotive products like Armor All and or even house hold products like Pledge. Be wary of any acid based over the counter cleaning product as they can damage the surface of the trailer. When in doubt, check the product ingredients and look at online reviews for each cleaning product to determine if it is safe to use. What type grease do I use in my bearing system? EZ Loader Custom Division utilizes two types of lubrication systems. 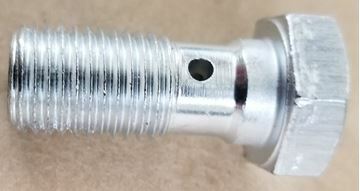 The first is known as EUZ, manufactured by UFP, a division of Dexter Axle, in which the lubricating grease is inserted into the fitting under the rubber cap and uses standard marine grade grease that you can find in most auto-part stores . The second is known as the Vault "Hybrid Lubrication System” which should not require maintenance for 5 full years. The hybrid oil for the Vault system is only available from EZ Loader Custom or UFP in San Marcus, California. For more details on the Vault bearing system please visit ufpnet.com. How far do I back the trailer into the water to launch or load? Every boat ramp is going to be a little different when launching depending on how steep it is. The style of the hull will also play a factor into launch but generally you will want to back the trailer up until the back of the fender is just under water. This will allow the boat to float off the back of the trailer. Backing the trailer too far into the water can cause the boat to drift uncontrolled and potentially cause damage to the boat. Make sure to have a bow line secured to the bow of the boat when unloading. When loading the boat it is important to make sure to get enough lift from the bunks to seat the boat properly on the trailer. Start by backing the trailer in the water and submerging the carpeted bunks completely in the water. Pull forward until about 6 to 8 inches of the center bunks are sticking out of the water. It's important to have the bunks wet to help ease the boat on the trailer. You may have to play around a little with each ramp to find the sweet spot to load the boat on the trailer. EZ Loader Custom stands behind every trailer we make, from the time the trailer is manufactured until the limited warranty runs out, which is 6 years from manufacturing date, 5 years from the day of the retail sale, or whichever comes first. Per our warranty, we will replace or repair any defect in manufacturing, material and workmanship. In the event a trailer needs repair that is not covered by warranty, and we are able to repair it, EZ Loader Customs will do their best to satisfy that customer. Please note: we are not a body shop repair center. There are many older trailers still out there. If needed, customers can bring their trailer back to the factory for some adjustments and/or repair at their expense, and again our team will do our best to assist in getting it back on the road. That does not mean we can do it without notice. Please call 800 553 7855 ext. 4239 and ask for an appointment. Unfortunately, we will not be able to assist you with any competitors' trailers due to not knowing their manufacturing practices, nor can we take the liability of working on another brand of trailer. EZ Loader Adjustable stands behind every trailer made as well. EZ Loader Boat Trailers, Inc. warrants each new Adjustable Boat Trailer to be free from defects in materials and workmanship for a period of three (3) years from the date of manufacture, or two (2) years from the date of first retail sale, whichever occurs first. EZ Loader shall repair or replace, without charge, any parts found to be defective because of imperfect workmanship or materials, within a reasonable time after the trailer is returned at purchaser's expense to any EZ Loader authorized distributor or dealer. For more information call Customer Service at 800-398-5623. What is Custom Engineered Fitting? EZ Loader Custom Trailers manufacture to a specification usually outlined with the original equipment manufacturer (OEM Boat Company) and therefore most custom trailers are “ fit to a specific boat model”. This means our engineering staff designs and manufactures the trailer to the OEM customers' expectations, so that it fits a specific model of boat hull properly so as to avoid any problems while towing. The trailer is built to support the carrying capacity as outlined by the boat company, including the engines, dry weight of the boat, maximum fuel in gallons, any water, batteries, and/or special equipment. That carrying capacity, plus the weight of the boat, represents the GVWR (gross vehicle weight rating). This rating is printed out on the inside rail known as the Vin Tag. Then, per the OEM’s demands, the trailer is then finished with the highest rated components and accessories available in the industry including the highest quality commercial paint process available. The EZ Loader custom paint finish is color matched to the specific boat, ordered by the OEM, and there is no better painted finish available in the trailer industry worldwide.